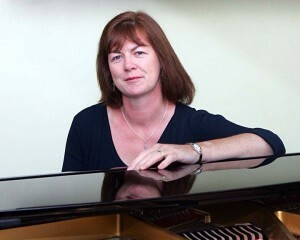 Founder and Director of the Carlow College of Music, Majella Swan, graduated from UCC in 1983 with a Bachelor of Music and Maths Degree and a Higher Diploma in Education. While in Cork she studied piano and violin at the Cork School of Music. Majella was an active member of both UCC choir and orchestra and for many years was also a member of the Irish Youth Choir. Majella formed the Carlow Youth Orchestra in 1996 and the Carlow Youth Choir, now known as ‘Sing Aloud’ in 1997, she also formed the Carlow Junior orchestra as a feeder for the Youth Orchestra. Majella is a member of the board of the ‘Irish Association of Youth Orchestras’. She has gained considerable experience singing with Canzona Chamber Choir and the Irish Philharmonic Chorus which included recordings, television appearances and singing in the world famous Carnegie Hall, New York. Majella has studied conducting with Dr. Geoffrey Spratt, Ildiko Herboly-Kocsar, Dr. James Jordan, Atso Almila, Sandra Dackow and Robert Houlihan. She was rehearsal pianist for Carlow Choral Society for many years and Musical Director of the Barrow Singers. In 2007 Majella was nominated for ‘Carlow Person Of the Year’ and subsequently received the ‘Music Award’ for her contribution to music life in Carlow. In March 2019 Majella was the recipient of Carlow Municipal District Mayor’s award For “Promotion of Music among the Youth of Carlow” Majella received the award from Cllr. Ken Murnane Mayor, Carlow Municipal District.